This post is sponsored by GNC Earth Genius, however, I am sharing my own thoughts. All opinions are my own. The US Food and Drug Administration has not evaluated the statements in this post. These products and statements are not intended to diagnose, treat, cure or prevent any disease. When life gets crazy, it can be convenient to make or grab whatever is easiest and be on your way. A lot of the time, that means some not-so-healthy meal choices packed with unrecognizable ingredients and lots of added sugar. This is why I’m such a huge fan of one-pan meals. Everything goes in the same pan, is cooked at the same time, and there’s minimal clean up. It doesn’t get much easier than that! Another great thing about them is that they can feed the entire family, or if you’re cooking for one, they’re a great way to meal prep for the week. One of the prime times that a one-pan meal comes in handy for me is at breakfast. You don’t have to wake up an extra hour early every day to cook and can instead just pop your prepped breakfast in the microwave (or eat it cold) and go. That’s why I love these mixed berry baked oats. They require minimal ingredients, most of which you probably already have on hand. And they’re packed with greens from Earth Genius Mixed Berry Smart Greens. 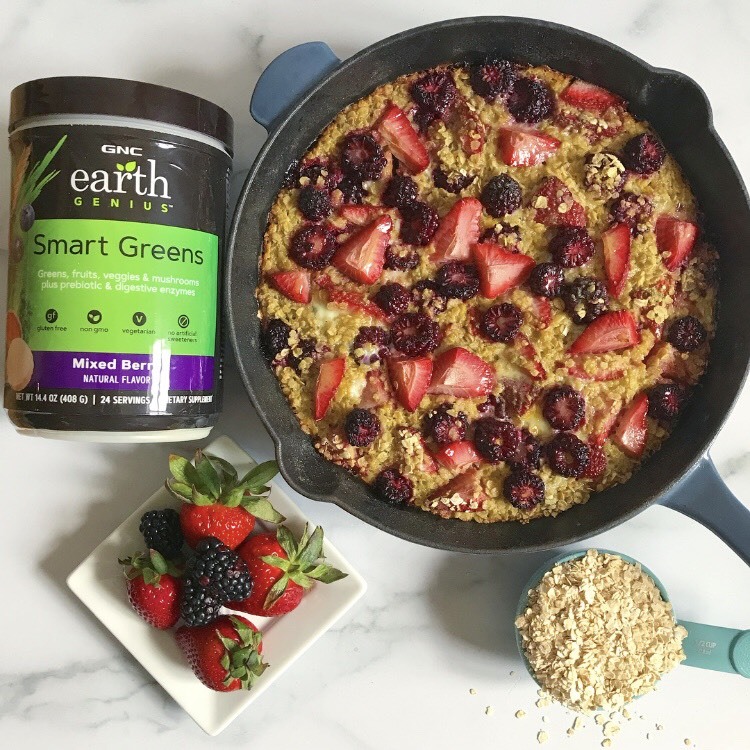 The product I use in this recipe, the Mixed Berry Smart Greens, is a blend of organic greens, veggies, superfruits, antioxidants, digestive enzymes, organic adaptogenic mushrooms, organic sea greens, and prebiotic Inulin. It tastes absolutely delicious, and I guarantee that nobody will guess your sneaking greens into these oats. They’re sure to beat any store bought insta-oats you find on the shelf. Mix the rolled oats, baking powder, Earth Genius Smart Greens, and salt in a large bowl. In a separate bowl, mix together the whisked eggs, milk, 1.5 tbsp butter and maple syrup. Mix the dry mixture with half of the berries (reserve half to top the dish), and evenly spread throughout a cast iron skillet (or 9x9 baking dish). Pour the wet mixture over the dry and top with the reserved berries. Bake in a preheated 400 degree oven for 35-40 minutes. Drizzle the remaining 1.5 Tbsp of melted butter over the top of the oats. Let me know what you think of the recipe in the comments below, and also feel free to share your favorite Earth Genius products and genius recipe swaps. This post is sponsored by RiceSelect, however, I am sharing all of my own thoughts. All opinions are my own. Things have been hectic over here between moving, settling in, and a busy work schedule! It’s been hard to find the time and energy to cook as much, especially after a long day. That’s why easy, one-pan meals have become a life saver. Throw it all in a pan followed by a minimal and easy clean up? Yes please! My favorite has been this chicken burrito skillet. I’ve literally been making it at least once a week. Flavorful and packed with protein, this meal is sure to please the entire family. Trust me, you’ll have everyone licking their plates. And it’s made with great-quality, real food ingredients, the star of the show being RiceSelect’s Texmati Rice. Like all RiceSelect products, it’s all-natural and clean of preservatives, chemicals, and added substances as well as non-GMO verified. RiceSelect is made from the finest ingredients and uses exacting standards and rigorous attention to detail, resulting in the flavor, quality, and texture that you crave. You will see the RiceSelect difference before you even taste it! 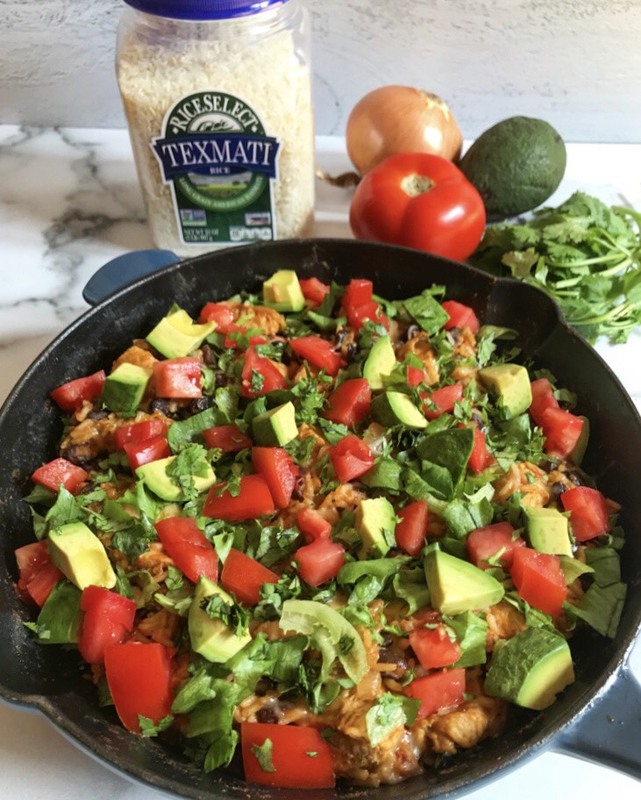 Naturally, RiceSelect Texmati was the perfect base for my burrito skillet. Add in some protein, delicious seasonings, and fresh veggies, and we have ourselves a meal! So let’s get to it. Add the avocado oil to a large pan over medium high heat. Add in the chicken and cook for 3 mins. Mix in the chopped onion, taco seasoning, black beans, rice, and water, and bring to a boil. Cover and cook for 10-12 minutes until the water is absorbed into the rice. Mix in the salsa, ½ cup of shredded cheese, and salt and pepper to taste. Top the mixture with the remaining cheese, lettuce, tomato, avocado, and cilantro. Easy peasy, and the cleanup is just as simple! It really doesn’t get much better than that. Let me know what you think in the comments below, and make sure to check out RiceSelect’s amazing line of products. You can get them delivered right to you via Amazon here. This post is sponsored by Flahavan’s Irish Oatmeal, however, I am sharing my own thoughts. All opinions are my own. Oatmeal is one of my favorite ways to start the day. It’s super easy and fast while also filling and nutritious. Plus, you’ll never find yourself getting bored because it’s so versatile. Whether it’s baked or on the stovetop, topped with fruit and nut butter or a savory twist, it’s always a delicious was to get the day going. Savory oats are my personal favorite way to enjoy oatmeal, and today I’m going to share my favorite savory oat recipe with you all! The most important part of a great oatmeal dish is, well, the oats duh! That probably goes without saying, but it is so, so true! That’s why I use Flahavan’s Irish Oatmeal for this recipe. They’re high-quality, minimally processed, and naturally creamy in texture. Not to mention, Flahavan’s only works with like-minded farmers they know and trust, to select the best quality non-GMO oats, while protecting and sustaining the land. They've even recently launched new packaging highlighting the Irish family farmers that have been helping to bring field to spoon for generations! When it comes to Flahavan’s Irish Oatmeal, you just simply know you’re getting the best! And they truly are the perfect base for some delicious savory mushroom and spinach oats. I love packing veggies into my breakfasts, and mushrooms and spinach complement Flahavan’s Irish Oatmeal perfectly. Add in some garlic and parmesan for that extra flavor, and we have ourselves a meal! Easy 5-minute Irish Steel Cut Oats with minimal ingredients; it doesn’t get much better! In a small pot on the stovetop, combine the oats and milk and/or water over medium high heat, and bring to a boil. Once boiling, turn down the heat to medium, and cook, stirring regularly, for about 5-7 minutes until the liquid absorbs into the oats. In the meantime, heat up 1 tbsp avocado or olive oil in a pan over medium high heat. Once hot, add in the sliced mushrooms, and cook for 3-5 minutes. Mix the garlic and spinach into the pan of mushrooms, and cook for an additional minute or two until the spinach wilts. Mix the veggies, parmesan, salt, pepper, and red pepper flakes (optional) into the cooked oats until the cheese is fully melted. Serve, top with your favorite toppings, and enjoy! My go-to topping is a fried egg. The runny yolk mixed with savory oats just cannot be beat! I also love to add fresh avocado. Play around, and see what works for you! Let me know how you enjoy this recipe in the comments below! When it comes to healthy eating, I’ve gotten a lot of feedback about it being intimidating. People don’t know where to start, or it’s too time consuming to eat healthy. I get it. Fast food is quick. Eating pre-made frozen meals is convenient. But eating healthy, nutritious meals can be just as easy and convenient! This is one of the many reasons I’ve come to love GNC’s Earth Genius line. Earth Genius is a comprehensive, wholesome line of products that are inspired by nature and crafted by experts. All products in the line are non-GMO, gluten free and made with wholesome ingredients that contain no artificial colors, flavors and sweeteners. Each product is specifically crafted to provide a solution to a variety of concerns. Through the month of March, you can use this link http://bit.ly/2SJJvaF or head into your local GNC to BOGO 50% off all Earth Genius products, making it the perfect time to try different products in the line. One of my personal favorite Earth Genius products is their Superfoods Supreme which comes in two flavors, Vanilla Chai and Mixed Berry. It contains 35 superfood ingredients, pea protein and prebiotic and enzyme support. With a wholesome blend of real fruits, veggies, greens and sprouts, it’s an easy way to add nutrition to your daily diet. It’s delicious on its own mixed into water and also a great base for some delicious recipes. I decided to whip up a super easy, nutritious pancake recipe with the Vanilla Chai flavor. It includes just two other ingredients besides the Superfoods Supreme and takes under 15 minutes to make. Who needs frozen pancakes with ingredients you’ve never heard of when you can have a superfood-packed, nutritious and delicious vanilla chai stack? Mash the banana using a fork or hand mixer. Add in two whisked eggs and 1 scoop Earth Genius Vanilla Chai Superfoods Supreme, and mix until well combined. Ladle pancake-sized pours of the mixture onto a preheated, greased pan over medium high heat on the stove top. Cook for 3-4 minutes until the bottom is cooked, flip and cook an additional 3-4 mins. Top your pancakes with your favorite toppings (I suggest nuts, fresh fruit, nut butter and/or maple syrup), and enjoy! It really doesn’t get easier (or more delicious) than that! 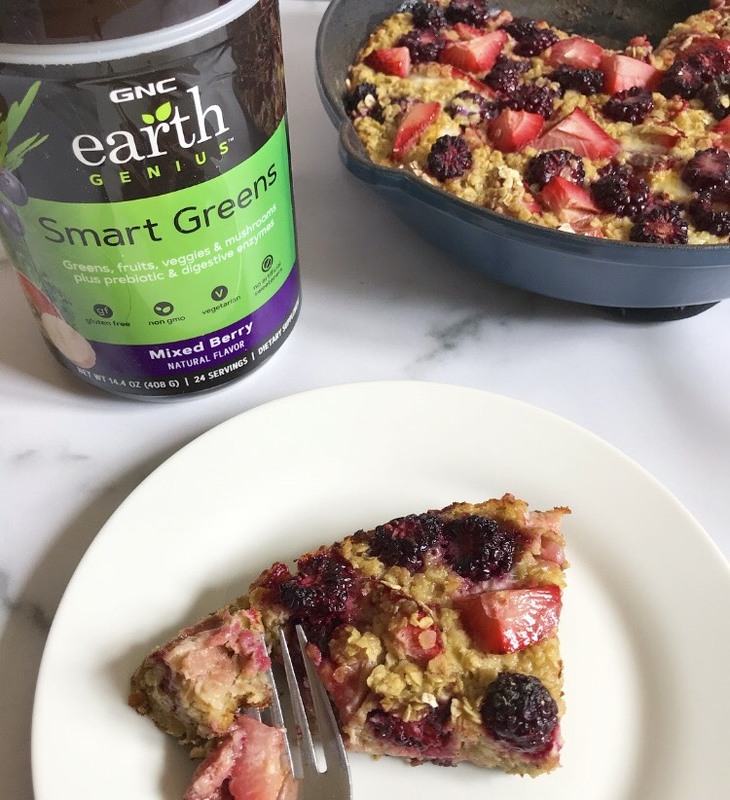 Let me know what you think of the recipe in the comments below, and also feel free to share your favorite Earth Genius products and genius recipe swaps. This post is sponsored by Green Valley Foods, however, I am sharing all of my own thoughts. All opinions are my own. We’re coming up on the new year which means fresh starts and new year’s resolutions. One of the resolutions at the forefront for a lot of us is being more health conscious. And again at the forefront of ignored resolutions is that very same one getting pushed to the wayside. We go through all the excuses - it’s hard, it’s expensive, it’s time consuming. But really, it doesn’t have to be! That’s why I’ve teamed up with Green Valley foods to show you how easy AND affordable eating organic can be. I whipped up these delicious vegetarian stuffed peppers that are also gluten free and super quick and easy to make. The whole family will love them, and they’re so simple that the kids can even get in on the fun of helping to make them. So why Green Valley? They’re the obvious choice because all of their products are USDA organic, non-GMO, BPA-free, gluten free, and made in the USA. You can pick up the corn and black beans for this recipe at your local grocery store and not have to worry about any of it going bad because they’re both shelf stable. They’re also very affordable making it easy and reasonable to eat organic. You can even order them on Amazon. It really doesn’t get much more convenient than that! 1) Preheat your oven to 425 degrees. On a parchment lined baking sheet, bake the halvedpeppers for 15 minutes. 2) In the meantime, strain the black beans and corn. 3) Mix together the beans, corn, diced tomatoes, red onion, taco seasoning, and cheesetogether in a large bowl. 4) Remove the peppers from the oven, and fill each pepper with the mixture. 5) Top each pepper with a sprinkle of cheese, and return them to the oven for 15 minutes. 6) Remove the peppers, and top each with green onion. Let me know what you think in the comments below, and make sure to head over to http://www.welcometogreenvalley.com to learn more about all of Green Valley’s organic products.